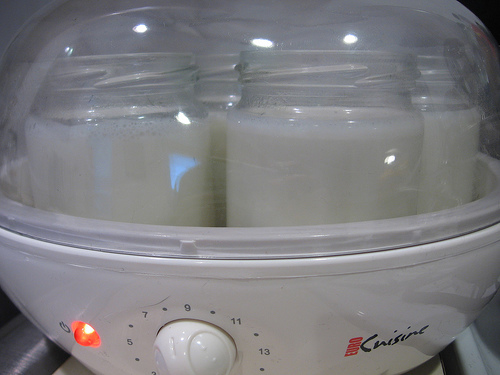 Recently I made my own yogurt for the first time ever, employing a Euro Cuisine Yogurt Maker (I know, I cheated!). It was a lot more work than I had anticipated, even with a machine, and took me several attempts before I achieved a desirable consistency. Not long after my first shot with the Euro Gourmet, I saw a post on Money Saving Mom about making yogurt in the slow cooker, and was intrigued. It looked so much easier! I determined to try it. And I have. For the benefit of other would-be-yogurt-makers, I'd like to post a comparison of my experience with the two methods. It is easy to achieve a nice and thick yogurt (my personal preference!). Yogurt is stored in charming, single-serving sized glass jars. You still do all of the work you would do without the machine- slowly heating the milk, waiting for it to cool, sterilizing containers and tools, etc. The Euro Gourmet is known to overheat the yogurt, killing good bacteria (which is the main reason we eat it to begin with!). Supposedly, this can be remedied by placing a few layers of paper towels in between the jars and heating element... but I was still nervous that they were getting too hot, and wasn't sure if my healthy bacteria were alive and prospering. The seven little glass jars are kind of a pain to clean and sterilize. Ridiculously, super easy! It took only a few minutes here and there throughout the day. I was able to do a much larger batch, more fruit for less labor. The yogurt is thinner and kind of runny. The chunks that would be strained out of the milk before letting it set with a yogurt maker were left in, creating unappetizing chunks of yogurt. 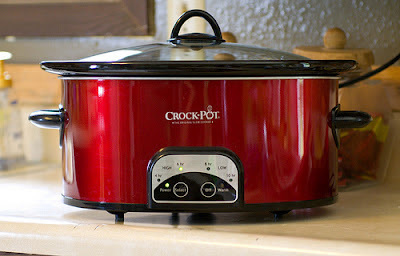 The bottom line: yogurt in the machine is a much nicer consistency, but it is way more effort, holds only half of what my slow cooker does, and probably kills the beneficial bacteria in the yogurt. Maybe sometimes the craving for a nice thick yogurt will motivate me to pull out the machine. But for now, the easier a task, the better, so I think I'll sacrifice my preferred texture in favor of less work and effort :). How do you like your yogurt? If you make your own, what methods do you employ?